Another The Body Shop review for you guys today, this time it's the Seaweed Mattifying Moisture Lotion with SPF 15! I've never been a big fan of having to put sunscreen on my face because of how incredibly retched it smells. Something about it just gets to me and drives me crazy so I have to admit I usually neglect putting it on in lotion form and either don't wear any or use a powder that has it. I know I know that's really bad what can I say the smell repulses me! 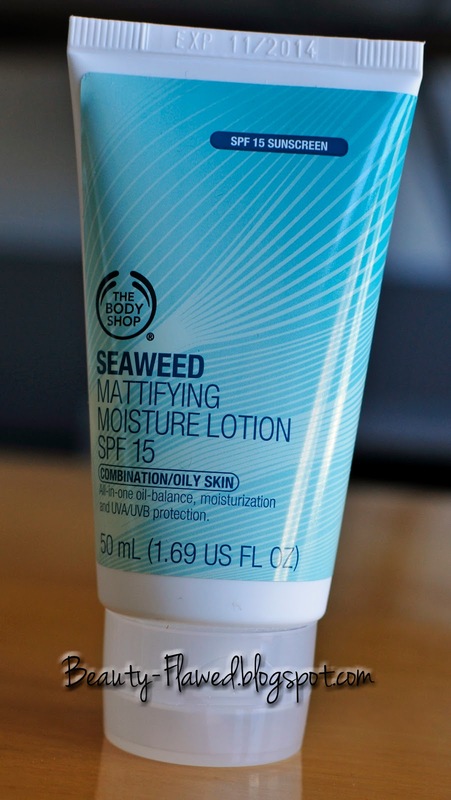 Lucky for me I found this amazing product and I am so happy to report that it doesn't smell a thing like sunscreen. It has this almost cucumber melon like smell to it, which I'm not sure why it reminds me of that since it doesn't have cucumber or melon in it. It does have seaweed though and I thought maybe that would make this smell like a fish-tank but it doesn't do that either! I like to use this strictly in my morning routine (who needs SPF when your sleeping?) and it does a great job of moisturizing my skin and keeping it matte throughout the day. I was particularly impressed with how well it moisturizes because I get these dry patches on my cheeks and nose and when I put this on you can't see them at all. Even if I apply makeup it helps make those patches disappear like they are not even there. Now an SPF 15 isn't all that high but coming from someone who hates the smell of sunscreen I'd say this is a start. I would advise not to slather this on like you would a plain old SPF product since this is also a moisturizer you can really get away with using it sparingly. The consistency of this is light yet creamy and absorbs into the skin quickly so you can go from moisturizing right into applying your makeup with little time in between. If you have oily or combination skin I would say that this is a product you need to try out. This product retails for $18.50 for 1.69 fl oz from The Body Shop online and in stores. You can also usually catch a sale on this so you can get it for a little less or if your part of that Love Your Body loyalty program they have where you get 10% off every order (and it stacks with sales) it's makes this $16.65 just with the discount so definitely not a bad price. I've had my bottle for about 4 months or so now and I still have at least half a bottle left, so it's well worth the money. Do you like lotions with SPF in them? Ingredients: Water, Ethylhexyl Methoxycinnamate, Cyclopentasiloxane, Octisalate, C12-15 Alkyl Benzoate, Butyl Methoxydibenzoylmethane, Glyceryl Stearate, Phenyl Trimethicone, Butylene Glycol Cetyl Dimethicone, Potassium Cetyl Phosphate, PEG-12 Dimethicone, Phenoxyethanol, Triethanolamine, Tapioca Starch, Carbomer, Cetyl Alcohol, Fragrance, Methylparaben, Zinc Gluconate, Hydrolyzed Algin, Zinc Sulphate, Tetrasodium EDTA, Butylparaben, Ethylparaben, Propylene Glycol Alginate, Hydrolyzed Wheat Protein, Sodium Stearate, Fucus Vesiculosus Extract, Linalool, Isobutylparaben, Propylparaben, Butylphenyl Methylpropional, Benzyl Salicylate, Benzyl Alcohol, Acacia Senegal Gum, Serine, Xanthan Gum, Citronellol, Alpha-Isomethyl Ionone, Tocopherol. You really should put sun screen on, my husband who's fair skin has neglected putting sun screen on his face. He is two years younger than I but probably looks 5 year older than me. I warned him years ago but he didn't listen. I'm indifferent towards moisturizers with SPF, but if I'm on a beach, I always put on sunscreen (rather than just let my moisturizer do the job). I am actually on the hunt for sunscreen that I can reapply in the afternoon on my face, and for some reason, I never think of body shop. That's a place I generally go to buy gifts for other people, their body scrub and butters are my favorite. I am the same way with sunscreen on my face...that's why I love Bare Minerals...it has built in SPF. This stuff sounds great too....use whatever you can to protect your skin! Thanks for the heads up!! This sounds amazing! Especially since it doesn't smell like normal sunscreen! I may just pick this up because of my problematic skin! Good going, Body Shop! I do have a moisturizer with sunscreen it that I like, but I am careful about introducing too many chemicals on my skin. So, I would want to check out the full list of ingredients on this, but I am intrigued! I'm really glad that you were able to finally find a sunscreen product that you can stand the smell of and that works great. This sounds like a fantastic product, and I'm glad that you can find it on sale easily because $18.50 for 1.69 ounces is a bit much. oh hahahaha, I know what you mean about that sunscreen smell! I hate that smell too. I use a moisturizer with spf and if I'm wearing tinted moisturizer, I also get them with spf! I have been on a hunt for a good sun screen. I need to check it out. Thank you for sharing!